With Telecare pods, classrooms, recreational space and an oral health unit, the Royal Far West Centre for Country Kids at Manly provides country children with access to the same level of health and wellbeing services as city kids. 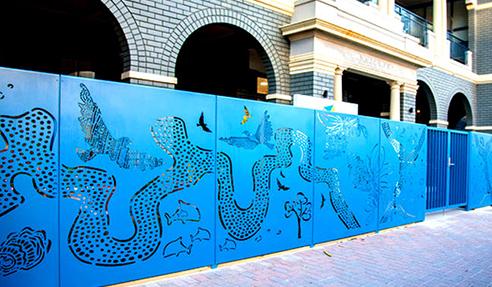 Di Emme and sister company, Chiaro Screens worked with Indigenous artists, Jessica Birk, Frances Belle Parker and Andrea Pindan, to create the eye-catching art fence that borders the site. Chiaro Screens was entrusted with redrawing and interpreting the original artworks to suit the laser cutting process and the panel format. Di Emme worked with FDC Constructions on the structural design and installation of the 37m art fence. The result is an architecturally sound fence that remains true to the original artworks, Healing Connections - Coast to Country and Wirnpa - Back to Country. For more information on art fences, visit www.diemme.com.au today. I would like to enquire about Di Emme Creative Solutions Pty Ltd.